UPDATE: This article has been corrected to reflect that this incident occurred during the 2018 first-round playoff series between the Jazz and Thunder in Utah. Matt Barnes, ​you may have a point. Though we don't know what really happened, we do know the consequences suggested something very serious did. 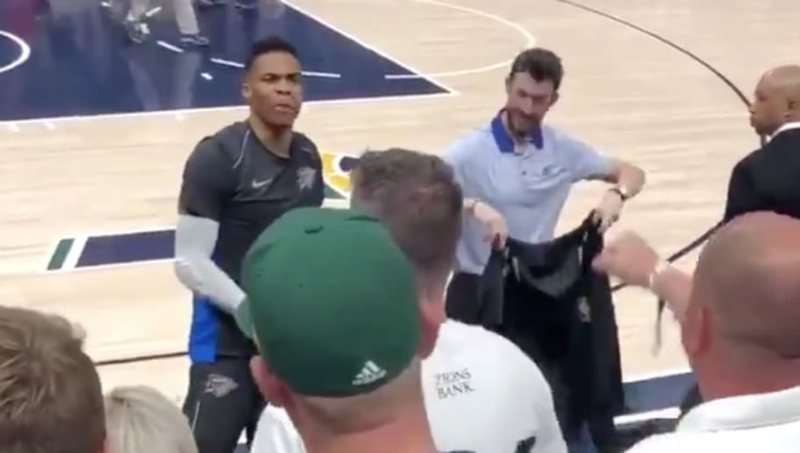 Russell Westbrook was fined $25K for his NSFW remarks that were ​caught on camera and the Utah Jazz fan in question with was banned from the team's arena for life. ​But now we have a pretty good idea of what Russ has dealt with previous in Utah, as video surfaced of ANOTHER Jazz fan repeatedly calling him "boy" during the two teams' 2018 playoff series. ​​Westbrook even responded to him, telling him to not say that anymore. No chance Brodie was dealing with this AGAIN from another fan. That explains why he was about to lose his mind on the next guy and not care about the repercussions. These Jazz fans certainly picked the wrong player AND sports league to mess with.